Between the ages of 30 and 80, your muscle strength steadily declines anywhere from 20 to 40 percent, according to “Fallproof! : A Comprehensive Balance and Mobility Program” by Debra Rose. However, many daily chores, such as lifting grocery bags, require a strong set of stomach muscles. While spot reducing is a myth and exercise alone will not rid the flab from your stomach, you can perform a combination of resistance exercises and cardio workouts to flatten your midsection as well as shed extra weight. 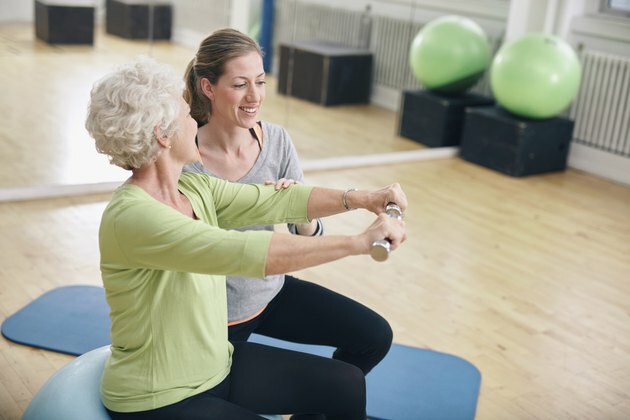 A wide range of isolation exercises -- curl-ups, leg raises, pelvic tilts, heel slides and isometric contractions – can help you to strengthen your abs, according to "Physical Activity Instruction for Older Adults" by C. Jessie Jones and Debra Rose. Pilates exercises for the abs -- roll-ups, oblique curl-ups and the Hundreds exercise -- also focus on spinal alignment and balance, helping older adults to maintain good posture. For example, begin the Hundreds exercise by lying supine with knees bent to your chest and hands on your knees. Exhale, contract your abs and raise your head and shoulders off the floor. Extend your arms past your hips, holding them at mid-thigh height. Lift and extend your legs toward the ceiling, rotating your legs outward with feet flexed. Hold this position, inhaling for a count of five and exhaling for the same count. Continue holding for 10 breathing cycles and then return to starting position. Perform 10 reps.
A chair is a convenient and helpful exercise prop for senior citizens. For example, use a chair to perform the sit-to-standing squat -- a compound exercise that conditions your abdominal muscles, hips and back. For example, begin by sitting erect on the edge of a sturdy chair. Plant your feet hip width apart on the floor and extend both arms in front of you. Exhale and lift your body off the chair, rising to about two-thirds of the way to standing position. You should be in a semi-squat position with knees bent and aligned over your ankles. Hold the squat for three to five seconds, inhale and then return to the seated position. Perform five to 10 reps.
By lifting a 2- to 5-pound medicine ball, older people can work abdominal flexion and rotation, according to Rose. For example, sit erect on a chair with feet shoulder width apart on the floor. Hold the ball in front of you at navel height. Exhale and extend your arms overhead, lifting the ball to the ceiling. Bend at the hips and slowly lower the ball toward your feet, keeping your back straight. Inhale and bring the ball back to starting position. Repeat the exercise, moving the ball in different directions -- left, right or in diagonal trajectories -- returning the ball to starting position after each movement away from your torso. Engage in endurance exercise, such as walking, jogging, cycling or swimming, to not only promote cardiorespiratory health but also burn fat and trim your stomach. The Centers for Disease Control and Prevention recommends at least two and a half hours of moderately intense aerobic activity per week for older adults. Aerobic activities that require good posture, coordination and balance, such as ballroom dancing, are particularly advantageous for senior citizens. In “The Complete Guide to Core Stability,” author Matt Lawrence noted that most of the people in a hip-hop dance class at a health club were age 55 and over. Even a 76-year-old was doing the hip-hop class to stay in shape. Will Sit Ups Flatten My Stomach?